You have to be creative to start a revolution. Suzuki certainly managed that with the introduction of the 1982 QuadRunner LT125, and as other manufacturers stuffed dealer floors with three-wheelers, Suzuki added a 4th wheel and changed the game forever. It was the biggest advancement in the sport before or since but it was hardly Suzuki’s last stroke of design genius. 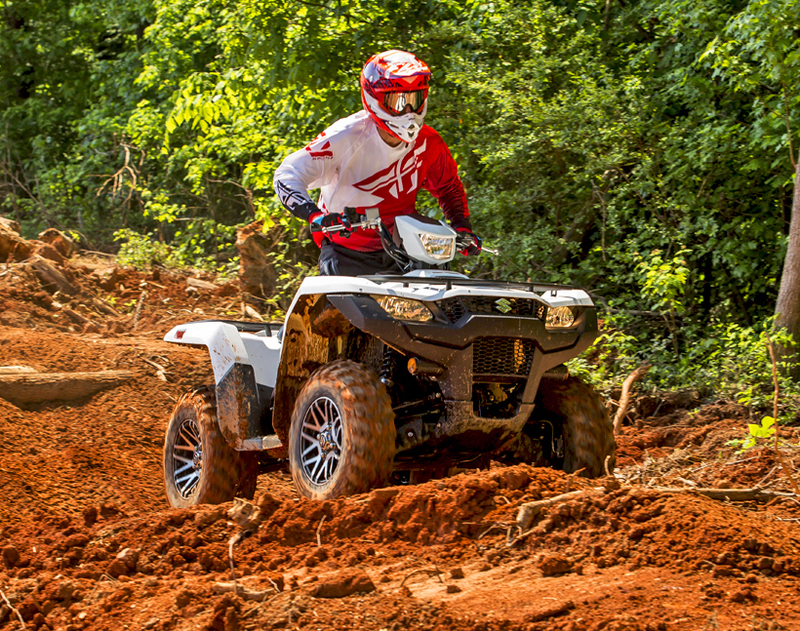 They again changed the sport with the introduction of the mighty KingQuad lineup, which took utility ATV performance to new heights thanks to far more powerful engines, better suspension, and features designed with hard work in mind. 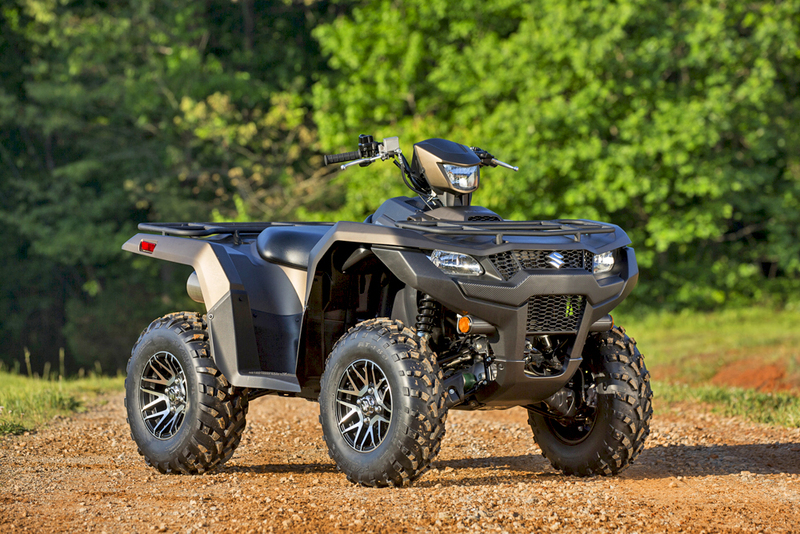 While Suzuki’s ATV division rolled up industry awards and acclaim, it was problems with the automotive division that derailed the Suzuki train, finally resulting in a complete corporate restructuring. Budgets were slashed and new model development would have to wait. 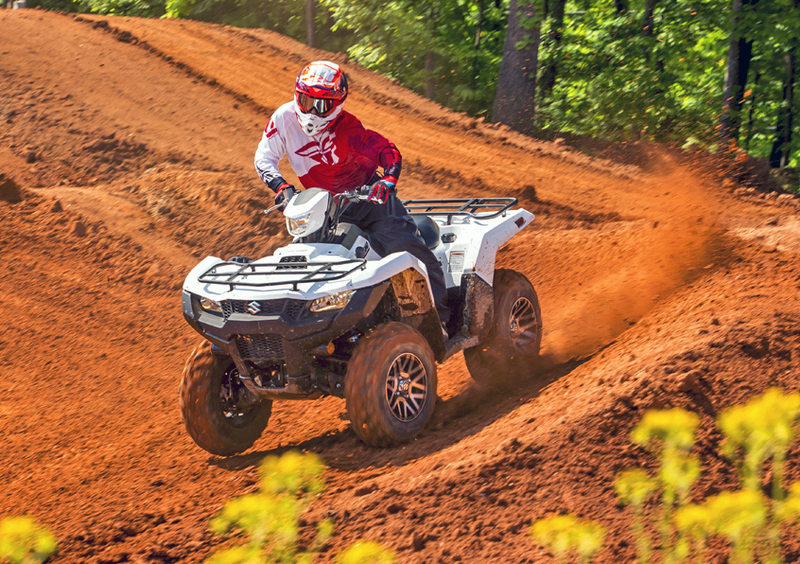 The 2019 KingQuad 750AXi represents a return to the game changing, revolutionary design that made the KingQuad great. We were thrilled when Suzuki called to ask if we would like some seat time on one. 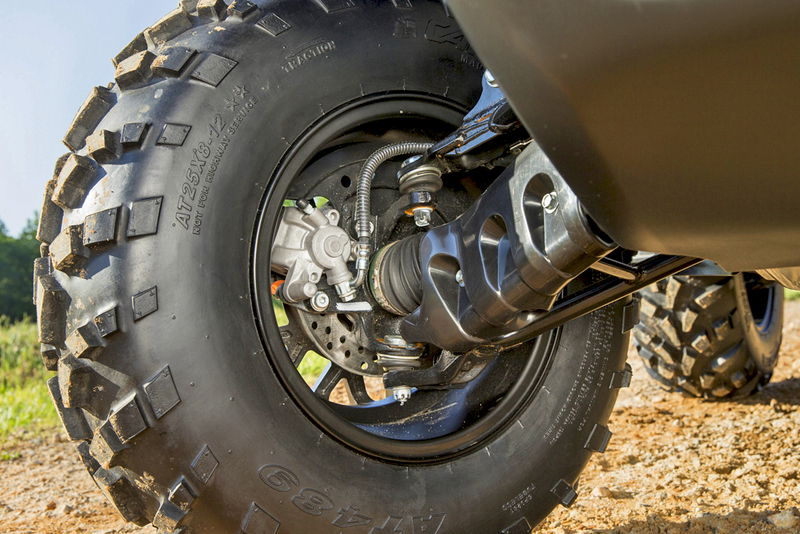 A redesigned chassis for better handling, less flex, increased towing and hauling, and improved steering geometry. A reworked, 722cc, DOHC, single-cylinder, liquid-cooled, four-stroke engine tuned for low-to-mid range torque to match the increased towing capacity, as well as high-rpm power. Engine is fed through EFI for a complete burn, and a catalyst in the exhaust keeps emissions to a minimum. The engine gets a larger oil pump and oil intake system to increase durability, and uses a sport bike derived chain and gear camshaft drive system creating a compact cylinder head. The cylinder is also plated for excellent heat transfer and engine reliability, and the head is tilted forward in chassis creating lower center of gravity. 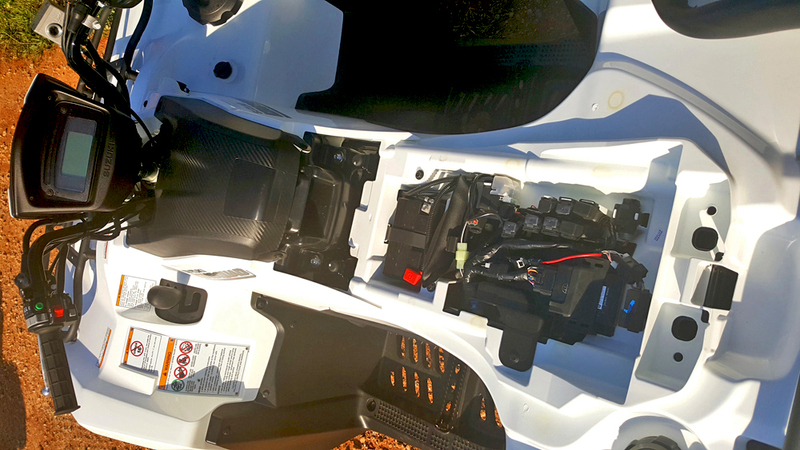 Entire chassis is designed for low center of mass, lower overall seat height, and better handling. Increased towing capability (1322 pounds) and a new rear sway bar for less body roll and consistent weight transfer in turns. Return of the center, handlebar mounted headlight! Makes for much better vision into turns at night, and a LED tail light alerts riders behind. 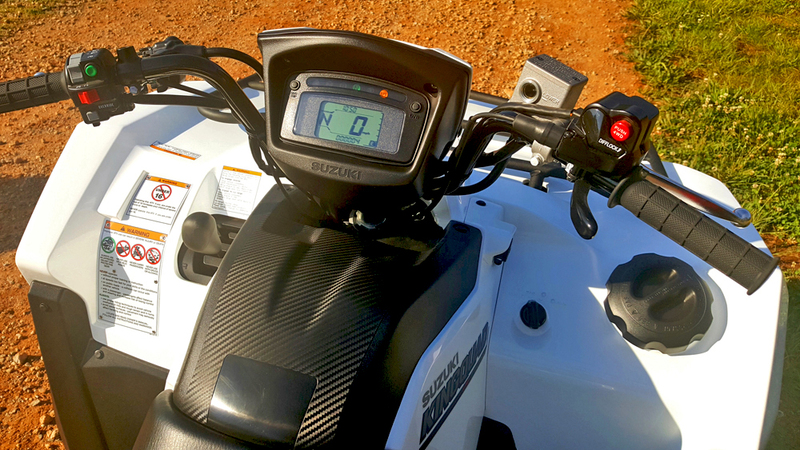 The updated, easier to read LCD instrument pod shows speedometer, odometer, twin tripmeter, hours, clock, and fuel level. LED lights for high, low, neutral, reverse and 2WD/4WD and differential-locked 4WD. LED cautions for fuel injection and engine temperature. Handlebar-mounted push-button controls permit easy selection between 2WD, 4WD and differential-lock 4WD. Steel-tube cargo racks with wrinkle powder coat finish for durability and scratch resistance. Pre-installed winch mounts and wire conduit for easy winch mounting. Sometimes big-bore engines can provide so much power they can make an otherwise great machine a handful for all but expert level riders. 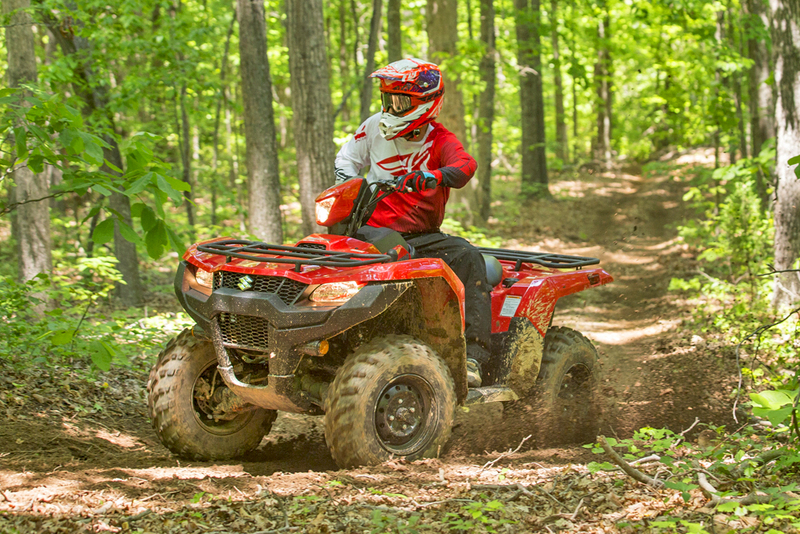 One of the best things about the KingQuad 750 is that it puts out mega-power when asked, but it’s still very easy to control. 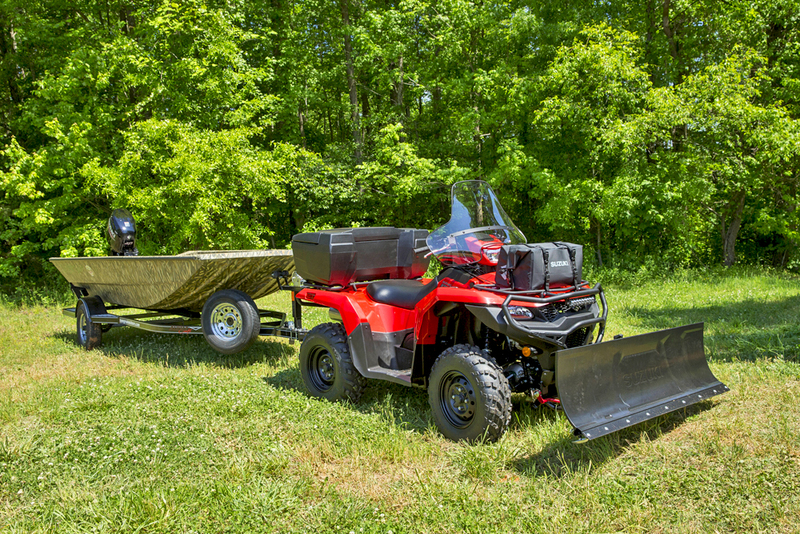 It’s up for towing any heavy load, pushing snow, or any other task that requires plenty of torque, but trail rides don’t turn into bull riding at the rodeo. 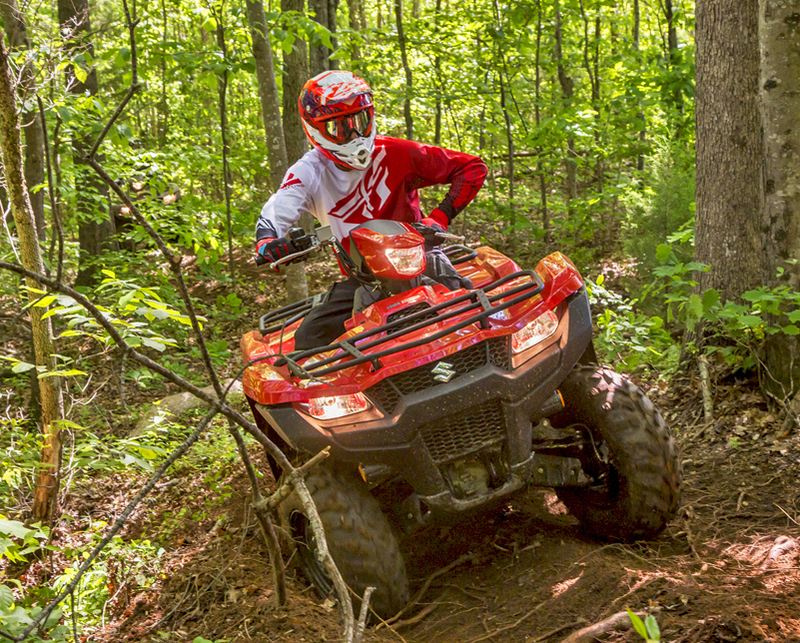 In our experience the KingQuad 750AXi engine has always been extremely reliable, but Suzuki reworked it with a couple major changes. A new oil pump with a larger volume was added, and small jets have been added in the crankcase to mist oil on the underside of the piston, creating a slightly cooler condition and added lubrication to the rod bearings. Mated to the engine is Suzuki’s Quadmatic CVT transmission. With the larger towing capacity this had to be reworked as well for increased low end torque. The CVT gets lighter roller weights, stiffer springs, and new cams. 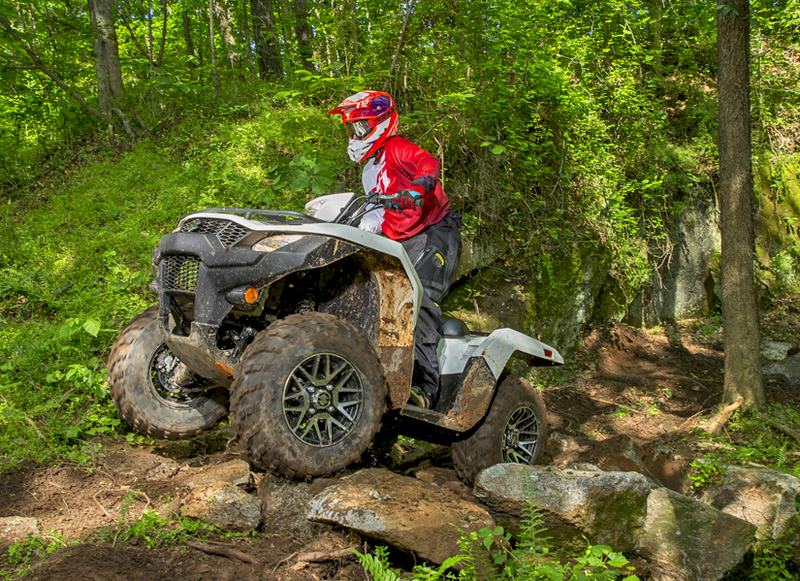 As usual, the gated shifter is smoother than any other utility ATV, and we LOVE how easily it glides between gears. It’s perfect for jobs like plowing snow. For heavy tasks we recommend using LOW gear, which is much easier on the belt. 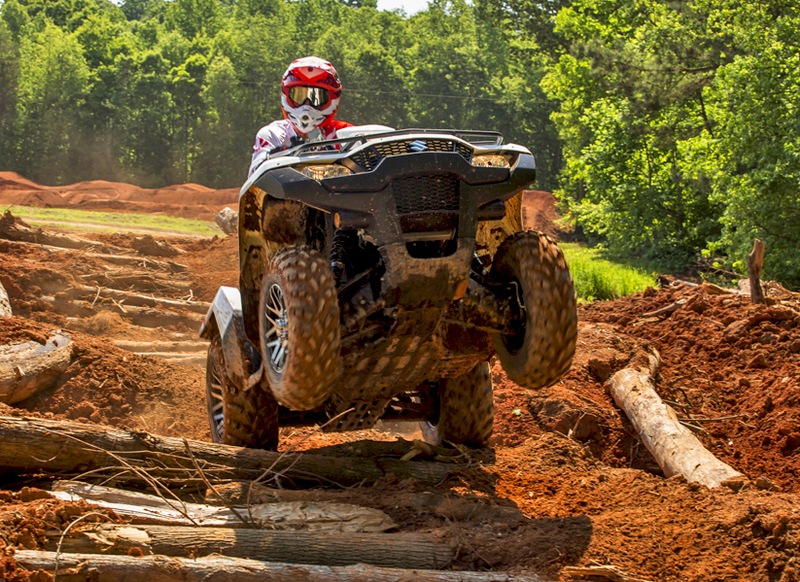 Engine braking is still standard on the KingQuad 750AXi. It all adds up to an engine and CVT package that won’t leave you walking. The KingQuads have always been comfortable thanks to excellent control layout and Suzuki’s T-Bone style seat, and that has not changed with the new model, even though the bodywork received major restyling for an “edgy” look. 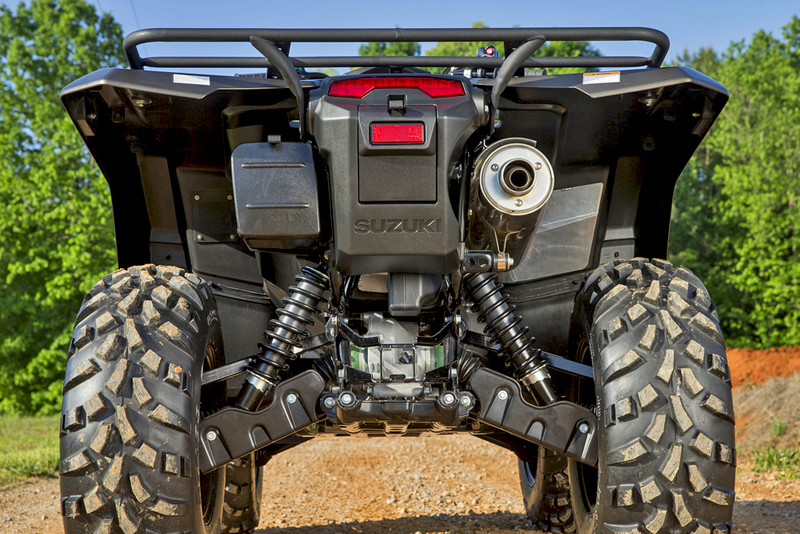 We were very happy to see Suzuki brought the center headlight pod back, and they still offer plenty of storage. In fact, there is now a 3rd storage compartment behind the rear tail light! 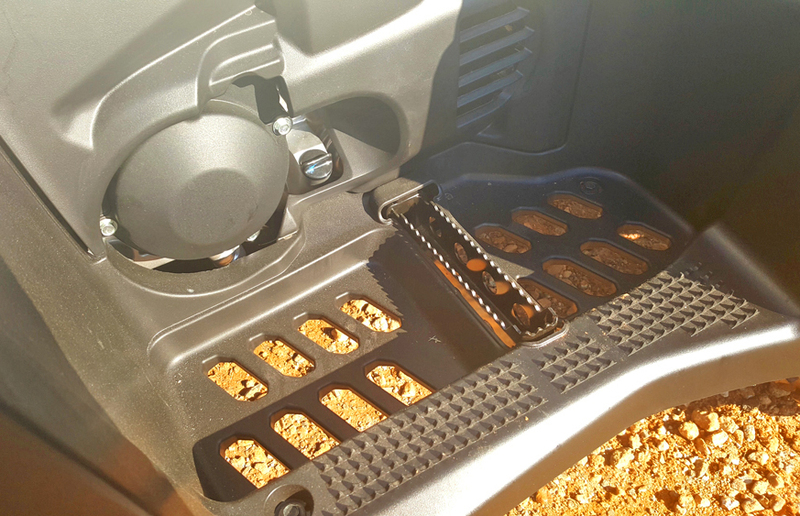 The steel racks have been beefed up for a larger load, and the seat still pops off easily for access to the air filter and battery. Best of all, the left body panel has an opening allowing you to reach the oil dip stick quickly, (something we skewered Suzuki on in the past, even taking a Sawzall to the bodywork to make our point once) and we like the raised pegs that anchor your feet securely, yet allow them to pivot as needed. The floorboards allow water to drain quickly, yet still provide security for your feet. 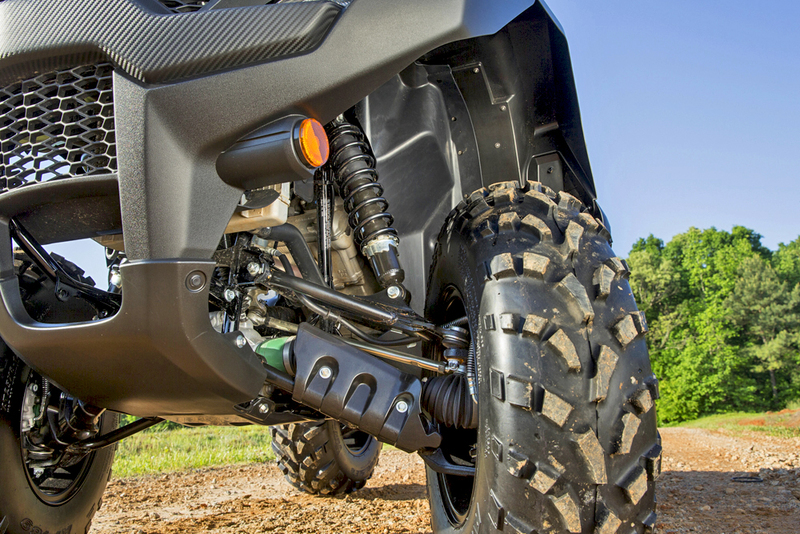 Suzuki did give the 2019 KingQuad 750 slightly taller bars, and we like the thumb throttle design which is comfortable on long rides. We also love the 2WD / 4WD / Diff lock engagement button on the thumb throttle housing. It’s easy to use and reliable. Although the new KingQuad 750AXi is a full sized, big bore utility ATV it doesn’t really feel like it. The bodywork is formed with tight seams that don’t catch your boots or riding gear, and it doesn’t feel bulky. The distance between your knees isn’t so wide you feel as if you’re perched atop a buffalo. This makes a big difference on the trail. It’s roomy enough to move around, yet it feels nimble winding between trees and over rocks. We’re not exactly sold on the taller bars, but that’s just personal preference. Taller bars do put you in a more upright, comfortable seating position that suits casual riders well. We do like the new shocks! They’re valved much better for low speed, choppy sections of trail and we never did bottom them over larger hits. The brakes are also smoother and stronger thanks to better pad material and improved lines with less flex. They are a measureable improvement. After all, if you’re going to tow almost ¾ ton you had better be able to get it stopped. Lastly, the new KingQuad 750 AXI is fairly quiet. There is no strange rattling from the engine or squeaking from the chassis, and the muffler does a good job on keeping the exhaust noise to an acceptable range. You can creep into the woods to the deer stand without scaring away the wildlife, or ride it all day without annoying the neighbors. EPS CALIBRATION – TOO MUCH of a GOOD THING? The machines we were testing were all 1st generation production units. That means they were not exactly pre-production, but more of a very early assembly run used to try tooling and assembly methods. It also means there is slight wiggle room for last minute changes to calibration and setup, and the Japanese engineering staff on hand grilled us for details. There certainly wasn’t much to complain about, but the one area most riders did mention was the Electronic Power Steering calibration. The new front end geometry, steering knuckle geometry, and EPS calibration were all meant to increase straight line stability. That worked, but it might be too much of a good thing. EPS calibration was intended to become increasingly more firm as speeds increase for better trail feel, but it sometimes feels as if you’re in 4wd. When in 4wd you’ll either want to go in a straight line, or get back to 2wd as soon as conditions allow. The simple answer is, the EPS system needs to provide more assist. The Suzuki engineering staff they told us of their stability concerns, but they were also eager for input. Since the EPS calibration would mean nothing more than a program change and could be implemented easily, there is a very real possibility the full production units will have the changes we asked for. It would make a great machine even better. We can’t say enough about how happy we are to see Suzuki return to their roots with the renewed creativity that built an industry. 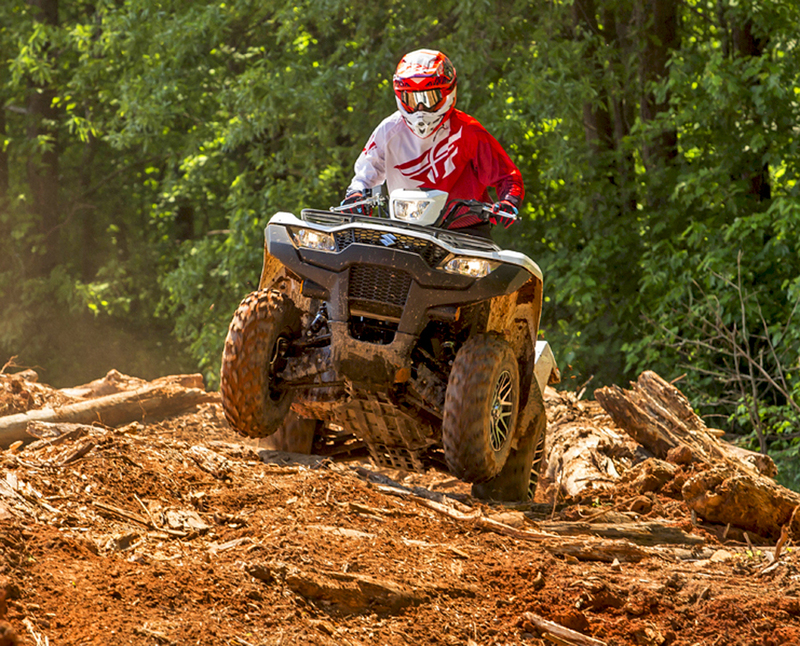 The 2019 750AXi is the latest generation of a machine that has marked so many firsts in the industry it could only be called the KingQuad. 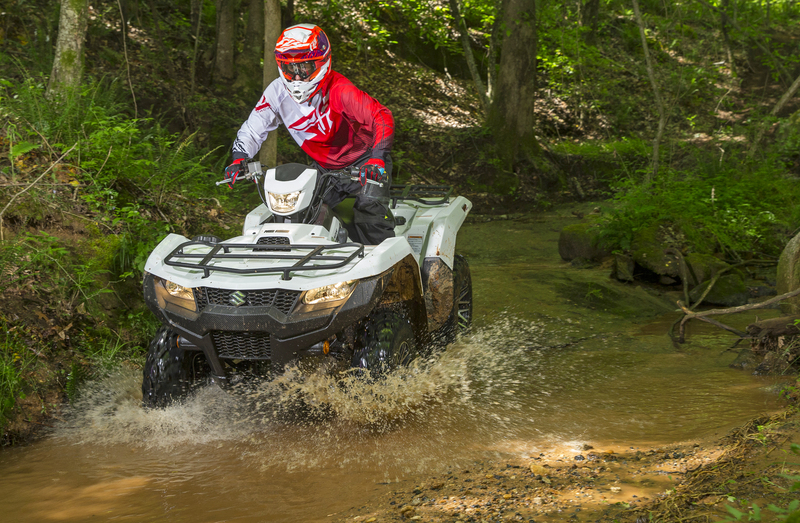 It was the first in almost every category, and that makes it a revolutionary ATV in every way. Long live the KingQuad. 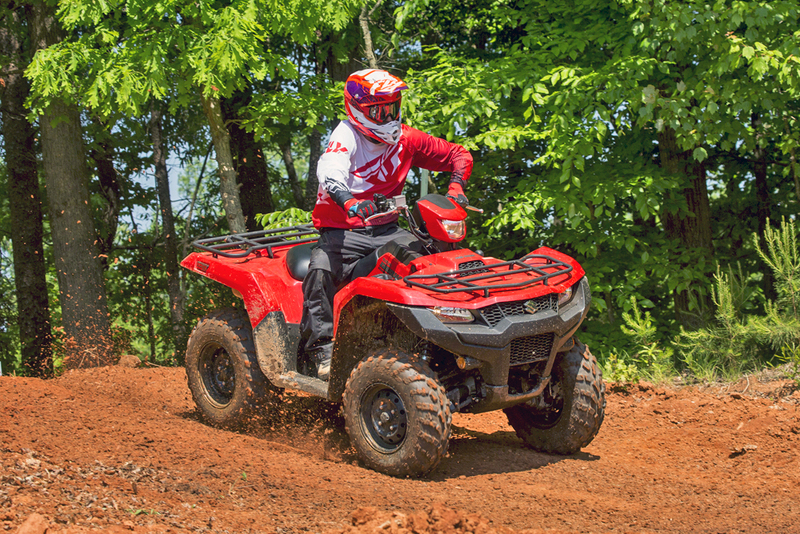 NOTE: There are five different versions of the 2019 KingQuad 750AXi to choose from, all built on the same chassis but with different option and trim packages.